When you hear Maginhawa what comes first to your mind? FOOD! Yes, a street full of exciting food to explore. Last week, me together with my fellow foodie bloggers took the challenge called Gumtect Food Trek. It was a mouth-full adventure. A food crawl with a twist of unexpected challenges that surprised us all. I was actually clueless as to how our adventure will go. Then we were given a short orientation and divided us into 5 groups to work together as a team. Each group consist of 4-5 members. 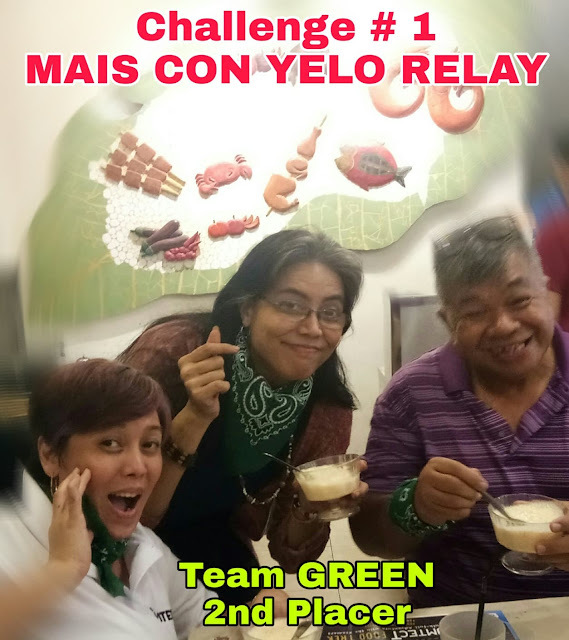 I got in to green team with great fighting spirit! First Stop at Gerry's Jeepney, a quite interesting place to dine in. They offer delicious Filipino dishes in small or big amount of serving. They serve big meals for boodle fight as well. 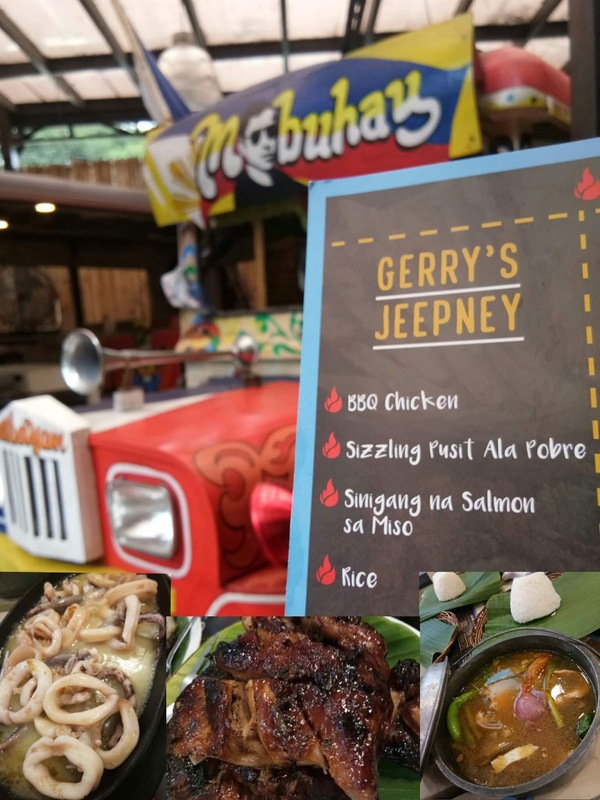 Inside Gerry's Jeepney, you can have a unique experience of having your meal inside their themed jeepney. After our first meal, Dr. JV Jaurigue, External Vice President of the Philippine Society of Periodontology, talked about the connection of gum health with overall health and stressed the importance of proper oral care. "Oral care is essential to our health. Rather than dealing with complications and difficulties of gum diseases, it is better to prevent them from happening,” he shared. For this first food trip we had the all-time favourite Sinigang Salmon sa Miso, Pusit ala Pobre, and Chicken Inasal/BBQ. Of course, my young foodie daughter loved the Salmon Sinigang, her very favorite sour soup-based viand. It's like our early lunch.I almost got full with this first meal. This Mais Con Hielo Challenge gave me so much reason to care more about my teeth. This challenge may look easy for those who are watching. But it's not! After having hot meals, switching to this cold cup of desserts can cause you pangingilo if your teeth are not healthy.Though it's not the pangingilo that bothered me in this game. It's the crushed ice that hindered my speed to finish. Good thing Tito Ted of Wazzup.ph and Mars of Astig.ph did it real fast. Still, it was fun! Second Stop at SORU IZAKAYA, serving a fusion of traditional and modern Japanese cuisine. I already got excited upon the entrance because I love ramen. I thought that they will serve it for sure. And they did! With this challenge, only 4 members were asked to play the game of finishing the Ramen noodles as fast as we can. 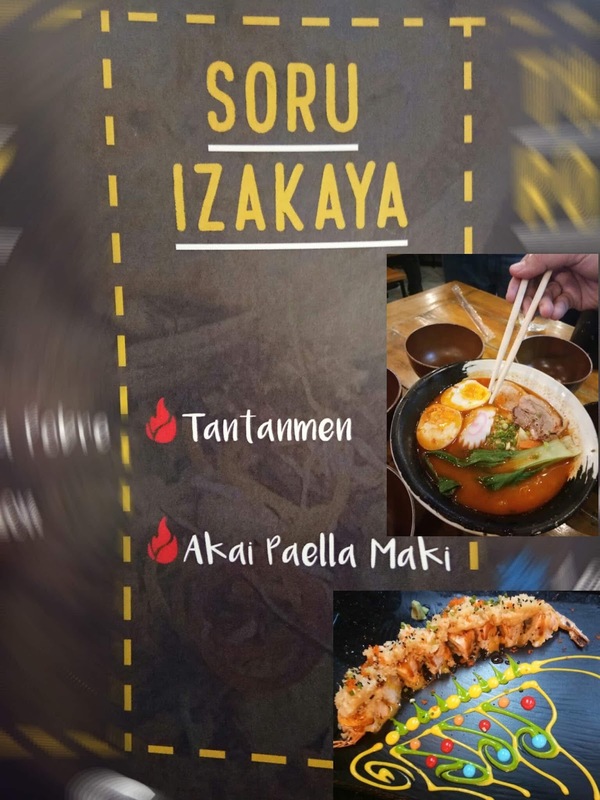 The thing here, it's not just the regular ramen, it's a spicy one, Tantanmen! 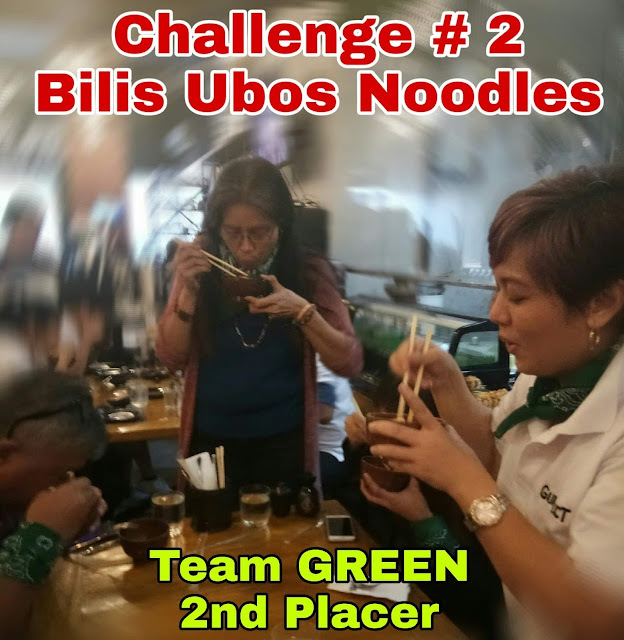 Imagine the challenge of eating noodles for a race is quite a challenge to me. Sip the Noodle Challenge, was truly a challenge! Well, we're the 2nd finisher! From the first challenge of finishing a cold cup of Mais Con Yelo to sipping a hot spicy ramen already tested my teeth and gum condition. This event is like an eye-opener to me, to always take care of our gum and teeth especially for the holidays. At the second food crawl the Kramers came in to share with us their story as oral healthcare advocates for Gumtect. 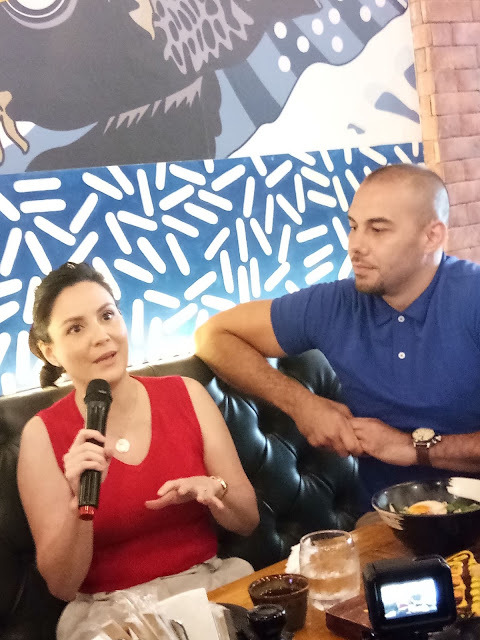 Doug and Chesca Kramer shared how important it is that they take care of their teeth and gums so they don’t miss out on any foodie moments when they celebrate the holidays with their friends and family. 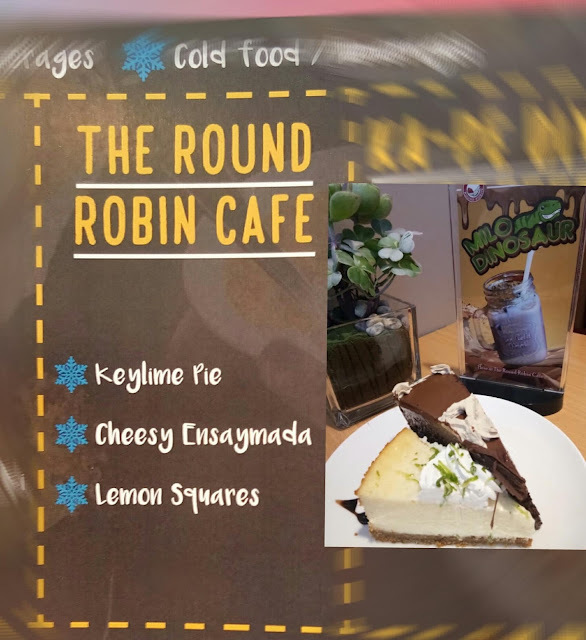 Third Stop, The Round Robin Cafe, they offer desserts and pastries where you can find simply irresistible treats that can definitely satisfy your sweet tooth. This time they served us the Keylime Pie, Double Fudge Chocolate Cake, and Lemon Square.I got my new favorite here, the Keylime Pie. While my young foodie indulged with the Double Fudge Chocolate Cake. For this third food crawl, we took the Gumtect Trivia Challenge. I missed talking photos of us because it was like a riot. Clues were hidden around the Cafe and the chaos begins. Everyone's excited to be the first one to give their answer. It was by points system. I think we got 3 correct answers with our team. Fourth Stop, at The KA-Pe DIY,a Filipino Coffee Shop where you can enjoy your own type of coffee plus the provided old Pinoy games like, Sungka, Dama and more. This time capping our food crawl with iced coffee. I'm not even a coffee fan but I have do it for the love of my team. And we got the 2nd place again. 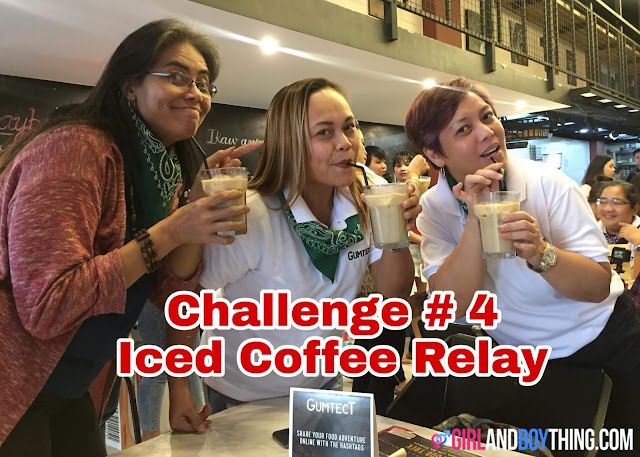 The Iced-Coffee Relay Challenge! Thanks to Cristelle Torres of girlandboything.com for taking our photo for this last challenge. My photographer/foodie got so busy watching the Pinoys game available inside the cafe. Yes, we Filipinos love to eat, and the holidays are definitely no exception especially with my family! With Christmas get-togethers and parties dotting our calendars, are our teeth and gums ready to take on the challenge of non-stop eating and drinking? Today is another day to remember, discovering that oral care is really important especially to foodies like us. To enjoy the food tripping, a healthy gum and teeth is a must. Good thing, GUMTECT had it covered for us!